The spectacular Champions of Magic are set to amaze and astound with their family show at Darlington Civic Theatre on Tuesday 31 March. 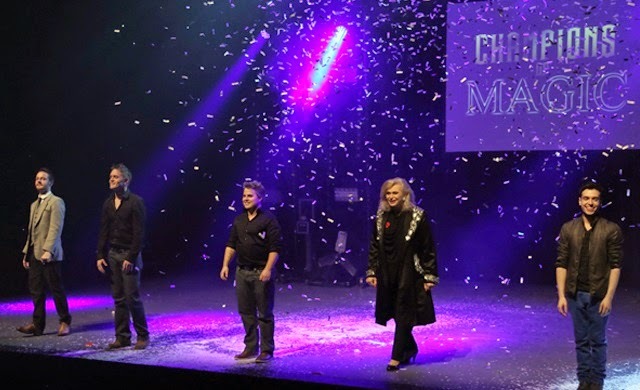 The Champions of Magic, the UK’s largest touring magic show, features five of the world’s finest magicians. The award winning team of tricksters are all set for a spectacular night of mystery that will keep you guessing for a long time to come. You will witness stunning illusions including disappearances, teleportation, levitation and a heart stopping finale that sees one performer walk through the spinning steel blades of a giant industrial fan, all presented with lighting and pyrotechnics to rival the biggest arena productions. This is your opportunity to see the mysterious world of magic up close. The team is made up of Young & Strange, grand illusionists who have appeared on ITV’s Penn & Teller: Fool Us. Fay Presto, Queen of close-up magic who has performed for every member of the Royal Family. Alex McAleer, master mind reader who has featured on ITV’s Good Morning Britain, and Edward Hilsum – IBM International Champion of Stage Magic 2014. Alex McAleer is currently baffling the Editor of The Northern Echo, Peter Barron with the challenge that he can predict the front page headline of a future edition of the newspaper. An exclusive, sealed envelope has been sent to the Editor and the result will be revealed at a special unveiling at Darlington Civic Theatre on Friday 20 March.